If you’re saving for a child’s education, you know that every dollar counts. But do you know how much you’ll really need when it’s time to start paying the bills? If you’re like most parents (or generous grandparents), you probably don’t. If you look up tuition and fees for a specific college, you can find a dollar figure anywhere from about $10,000 a year at an in-state public college to $35,000 per year and up at a private college. ** But that doesn’t include room and board, books, supplies, or transportation. At many schools, prices have become like airline tickets: People can pay different amounts. Financial aid covers a slice of college costs for a majority of students. It includes grants, scholarships, work-study, and loans. By using a net price calculator, you can estimate a school’s net cost for your child. To calculate your net price, you’ll input details about your income, your child’s grades, and your child’s GPA. The calculator will evaluate the information and provide an estimate of how much you’re likely to shave off the sticker price of that college, and how much you’d pay. It also includes information on potential financial aid and merit scholarships. Keep in mind that some calculators are more accurate than others. In general, the more details you need to enter, the more accurate your net price will be. You can also call the school to find out if its calculator tends to over- or underestimate the net price. 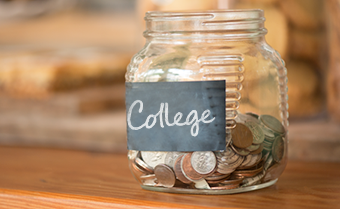 When your child is ready to attend college, you can apply for financial aid to get more detailed information on how much you will be expected to pay. Until then a net price calculator can give you an estimate. Let’s face it: Most parents can’t afford to cover all 4 years of college. Instead, think about saving a percentage of the costs. A common goal is to try to save one-third of the net price of tuition, fees, and room and board. That’s close to what most parents and students pay. According to the most recent report from Sallie Mae, most parents and students pay 29% from income and savings*. The rest comes from student loans, scholarships, grants, and contributions from family and friends. If that goal is too high, you might shoot for 20% of the costs. Remember, every dollar you save is a dollar your child potentially won’t have to pay back (with interest) after graduating. Another option is to plan on a less expensive school. You could also decide to save on room and board by having your child live at home and commute to school. Once you have a target number, break it down into regular goals. You might want to set yearly targets. Another good option is to invest a set amount every month. Making automatic contributions through payroll deductions is a good way to meet those targets. You can do this the same way many investors do in retirement accounts. It takes the willpower out of saving because you don’t have to make a decision every month to save. You only have to think about it one time. *Sallie Mae, "How America Pays for College 2016"